Looking for adorable nursery letters? Spell out a name or a favorite phrase with our best selling cursive wall letters. Hand painted antique white or pink and slightly distressed edges, our wooden letters are approximately 9" tall, 13" including ribbon. Our hanging wooden wall letters with ribbon are perfect wooden letters for nursery, baby name letters & wooden letters for kids room. 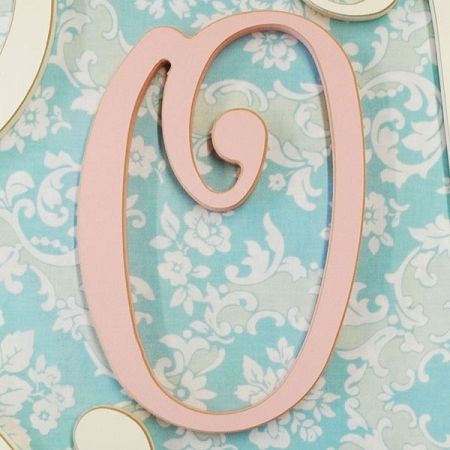 Customize your wooden letters for nursery by adding ribbon for hanging. Choose from our over 30 different ribbon color and style choices. 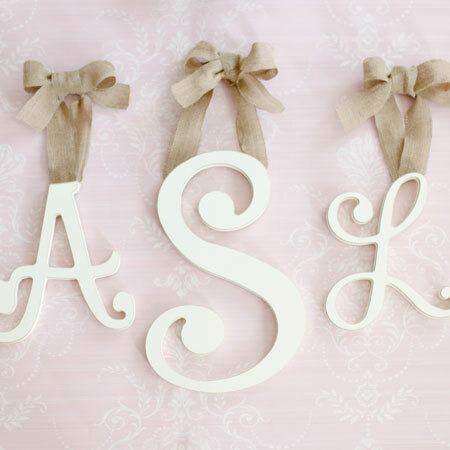 Hang a full name, initials in monogram style, or choose a fun word or phrase. Letters are a unique way to add personalization to a room. From pink and lavender for girls, to blue and gray for boys, your sure to find the perfect coordinating ribbon for your nursery, kids room or playroom. Our hanging cursive wall letters are made in the USA. See more nursery letter ideas: Wooden Hanging Letters, Polka Dot Wooden Letters for Nursery, Flag Nursery Letters, Storybook Nursery Letters, Wooden Capital Letters, Small Wooden Letters for Nursery and more!